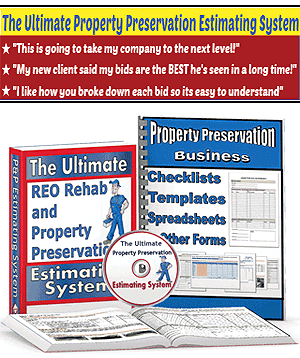 If you plan to become a Property Preservation Repair Vendor or an REO Repair Vendor, you will be expected to complete itemized repair estimates, or “bids” as they are frequently referred to in this industry. You will also be expected to use some type of estimating software. 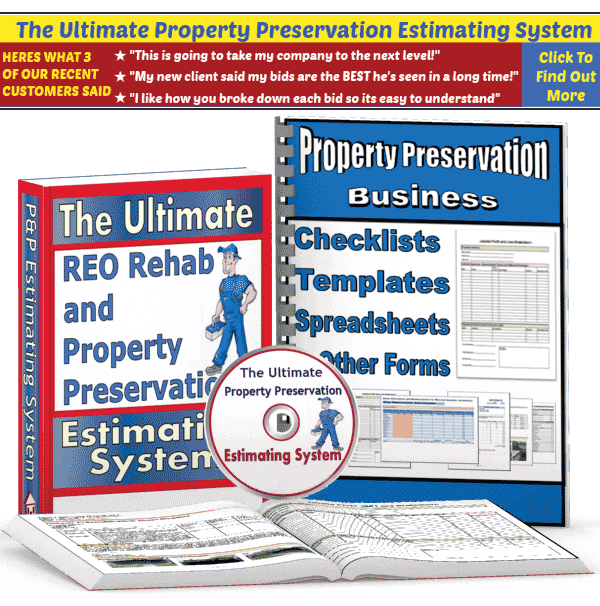 Property Preservation Repair Bids are similar to the itemized estimates completed by insurance adjusters. So if you have ever been involved in the completion of insurance claim repairs then you will have no problem. If you only complete the basic maintenance type work then you will not be completing these types of bids on a daily basis; however, it is still extremely important for maintenance vendors to know how to accurately price a job. Now comes the tricky part: calculating an appropriate bid that will secure you the work while also making sure you turn a decent profit. To stand a chance of winning the business, it is imperative that you understand how the system works. You’re in this for one thing: cash. There are a large number of elements that can influence what you can charge for your services. The appropriate fees can vary according to geography, your experience, the number of firms offering a similar service as yours in the area, the availability of skilled workers and the number of REO properties. However, while all this sounds very complicated, in reality, the basic cost structures are relatively similar throughout the country. 12. Basic tools, such as a drill and screwdriver, in the event that you are required to enter a property that has been boarded up. 13. A change of clothing. As soon as you arrive on the property, start taking photographs. You’re going to need to document everything for the purposes of your estimation and to provide later evidence of the work you have completed. Don’t be surprised if the neighbors approach you while you’re in the process of inspecting the property. Some will want to find out information about what is happening. Remain calm and explain that you are simply a contractor who has been brought in to take photographs. Tell them that you don’t know anything about the property and that they should contact the realtor/AMC for any information they need. This will usually get you off the hook. When you’re performing inspections for the purpose of producing an estimate, you need to stay alert at all times and focus on getting the job done properly but within the minimum amount of time. If you’re surveying a property in a rough area of town, take an additional person with you. Be alert at all times, you don’t know what is lurking inside the property, or outside for that matter. Unfortunately, this work is not all roses around the gate, and it’s important that you are fully aware of the health and safety risks and take appropriate action to mitigate them. Recall the sticky situations we addressed on Day 3? Be ready and prepared for all eventualities. You will frequently be asked to provide an on-the-spot bid when you visit a property. Sometimes, being able to produce a fair bid at a moment’s notice will actually win you the contract, especially if the realtor is in a rush. You will, hopefully, recall from an earlier section that there is typically a requirement for properties to be completely cleaned and junked out within five days of the initial inspection (external work within seven days). That is the work COMPLETELY finished, not the bid produced. If you have visited a site, it is in your best interest to get your quote in as quickly as possible. Return to your office, produce the necessary paperwork and get the estimate submitted. It doesn’t matter how busy you currently are cleaning out and maintaining the properties you already have on your books; you simply have to find the time to produce bids. If you don’t win bids, you have no new work coming in, and you’ll soon run out of business. In this industry, time is everything. By completing and submitting an estimate in a timely manner, you will enhance the view of your company as a reputable and professional provider and project the image that you are thorough and efficient. 1) It will be difficult to generate a quote. Without seeing the severity of the junk and the condition the property is in, you have no idea what truck to hire, how many people you’ll need and how much time it is going to take you to clear/maintain the place. It is only through seeing the place first-hand that you can generate a realistic bid. If you get your bid wrong, you could end up providing your services free of change… no one wants that! 2) You don’t want to give away your competitive position. You’re operating in an environment in which the lowest bid usually wins. If you’re contacted by phone, the person telephoning you may actually be your competitor trying to find out your pricing. Knowledge is power after all! If you are contacted by phone and can’t be sure that you are speaking to a real customer, ask the caller to provide the exact address of the property. If he or she is unable to answer immediately, you should remain cautious about what information you share. The same is true if they refuse to give you their full contact information and the name of the company they work for. 3) You will miss out on an opportunity to up-sell your services. One of the advantages of visiting the site for the purposes of producing a quotation is that you will have a chance to really understand what needs doing. You can then provide a basic quote as well as an additional list of things that are “optional.” For example, if you are asked to provide a quote for cleaning out junk but then arrive on site and find that the roof is leaking, you can include it in your optional section. However, remember to exclude the optional items from your quote for the services you have been asked to bid for. Otherwise, you’ll appear to be much more expensive than your competitors. 1)	Name, job title, firm and full contact details of the person calling. 2)	Full address of the property that requires servicing. 3)	Gate code, if relevant. 4)	Size of the property, number of stories and accompanying land. 7)	Whether or not an initial inspection has already been performed. 8)	The general condition of the property, how long it has been empty, etc. 9)	Whether there are any known hazards or organic material on site. 10)	The type of services that will be required. 11)	The deadline by which the bid needs to be submitted. 12)	Where the bid should be sent and who it needs to be addressed to. 13)	The timescale in which the services will need to be provided. Of course, in addition to submitting your bid in a timely fashion, you also need to ensure that it is fair, realistic and accurate. To do this, you need to be aware of what the going rates are for foreclosure cleanups and property preservation and maintenance. Once you have this information at your disposal, you can produce bids that are competitive and realistic. The scale of the work/the number of properties you may be required to service for a given customer. If you expect more work, you may wish to consider a bulk pricing approach. The extent of the services that you will be providing at the same property. The number of competitors in your area and the amount of business you are currently competing over. The area in which the property is located. The complexity and scope of the job. This industry isn’t particularly complex. As such, pretty much 99% of the time, the business will be awarded to the lowest bid. This means that your task is to figure out what that bid will be and how you can perform the work for that price while also turning a profit. It many ways, you are going to need to get creative. The contractor that wins the job for the junk out will pretty much always get the clean up work as well. When you submit your estimate, include two different bids, one for clean up and one for junk out, but also specify a special price if the two are contracted together. There are two types of cleaning services when it comes to REO properties: Basic clean and detailed clean. You can learn more about cleaning in the Maid Services page. Lenders and AMCs will usually only require a basic clean. If remedial work or repairs have been performed, they may ask for a detailed clean after the work. Investors usually want a detailed clean but will only be prepared to pay for a basic clean. Don’t forget to include the full scope of work in your bid to avoid any misunderstanding in this area. If you’re dealing with an investor, quote for the detailed clean unless you’re specifically asked otherwise. Some recurring services may be provided on a bi-weekly or monthly basis. Touch-up cleans don’t tend to pay too much, and most lenders have a monthly budget of around $100 per house. As such, it is usually better to offer a once monthly clean to make it worth your while. Generally, it will take a team of three people about an hour to provide a touch-up clean to a property of around 2000 square feet. Thank You for all the information you have provided. Im starting a preservation company myself but I’m gathering information from many sources and this page has been a real eye opener for me. Again Thank you so much and happy trashing!!! 3-How many times will you have to go back and forth before they close when you have big clean outs. Be at the property early in that case. Losers start at noon. 5- How big of a utility trailer do you have that will hold a riding mower, hand mowers, tools AND debris. Utility trailers are expensive, hydraulic ones even more. 6-Your riding mower will be repaired often thanks to high grass and rocks AND employees who care less about the blade or debris laying on it. 7-Some of these contractors will short pay you. Don’t drop what you are doing every time they beg you to satisfy an emergency without getting it in writing that they will pay you for trip charges. Decline it. Be aware that if you have a great route and they ask you to do another losing route that they can’t find someone to take they can drop you out of spite. 9- Take super powered flashlights for dark rooms and bathrooms. 10- Liability insurance is expensive. 11-These companies never mention Osha when they ask to you to climb on roofs. Do you know Osha rules? Do your employees have proper equipment? 12-These companies might openly tell you to do pest control on wasps or weeds. Call the EPA in your state before getting fines for illegal use of pest control. Try green products like vinegar to kill weeds or peppermint for bugs. Otherwise you better be certified. It’s time consuming to pass the exam. 13-Do you know how to do clear boarding on windows? Do you know where to go for cutting glass (Home depot/Michaels) and what to do if your employee breaks it before installing? It’s a long way back to the property. 14- Do you know how to winterize and if yes are you willing to be paid peanuts? It’s time consuming and difficult and your insurance may not cover your mistakes. 15-Do you have 2 months of working capital? You won’t get your first paycheck until 45 days later. That’s right. You have to front the money for a long time. 16- Some companies are unscrupulous. The girl assigned to you may be sweet but she may not be available to answer your questions on the spot. Frustrating. She might even give you the go ahead and then her boss will renig. She won’t blame her boss and lose her job. You are now out of pocket. Get things in writing from her boss or better yet decline the job with an apology that you are slammed. If the hud buyer doesn’t like the well installed siding that doesn’t match the 100 year old building you will be asked to redo it. I know, hud properties are sold as is but they always try to keep the buyer happy. Sub contract that stuff. 17- Get ready when the contract is up. HUD will snap up the lowest bidder. Not only will you be waiting for work from your new employer that HUD chooses but their prices may be so low that you cannot afford to be home in front of your computer answering emails from them or watching photos come in on dropbox and make corrections and calls to your guys. Your dirty truck will have to accomodate a well installed lap top to check emails and photos. I hope you saw that email telling you the property on the other side of town just sold before you spend gas to get there. Or find that someone else already did the yard cut or initial clean out. It happens. 18-Sometimes you are not paid enough for your trouble. No matter what politicians on the left say, HUD doesn’t care if you are paid below minimum wage because that is what it comes down to if you don’t know how to fix your equipment yourself or if you pay employees who don’t take photos correctly or who start too late in the day to finish a job an hour away. Your employee has no cash for gas or abuses the debit card by prepaying with a clerk and keeping the change. You have to go back. Tough luck. 19-Did you consider paying your employees yourself or calling in the hours to a payroll company. Don’t do it yourself or be a fool. Don’t even think about hiring ilegals. 20- Finally, I’ve just mentioned the physical and brutal work in the sun. When you get home you have to download/upload all the photos into electronic files with attached documents that have to be filled out and emailed with notations. Good Luck with your personal life. You are right on the money with your comments! what are some good companies to work for ? If I want to just do trash outs, clean ups and lawn care.. do I need to get certified on anything? I know that I’m gonna need business insurance and a back ground check. I want to list myself as a sole proprieter… will I need to register my business somewhere?